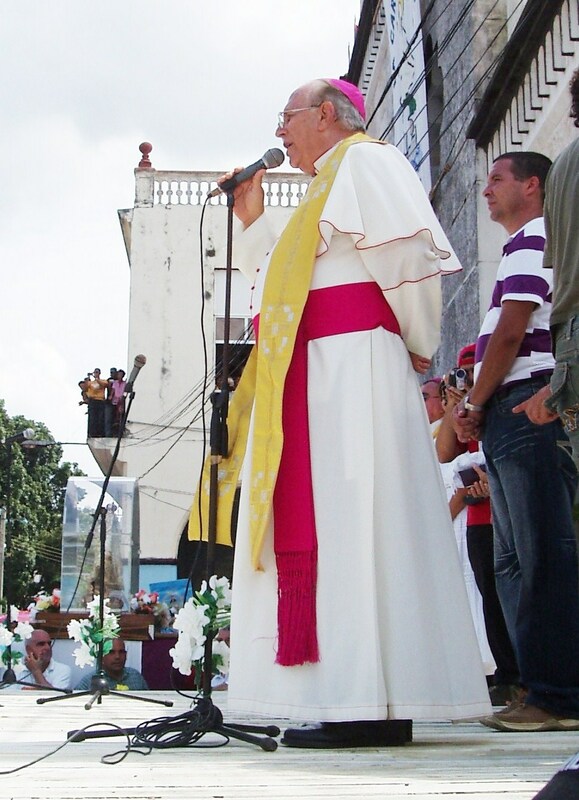 Last October 2, during the passage of the image of the Virgin of Charity through the municipality of Guanajay, I had the opportunity to listen, with my family, to the words spoken by you to the people gathered there to show their respect and veneration for the Mother of God and Patroness of Cuba. On the afternoon of that day, at the hand of Bishop Jorge Enrique Serpa Pérez, Bishop of the Diocese of Pinar del Rio, I visited Our Lady’s Hospital “Jose Ramon Martinez,” which was my place of work until April 2006, when I was suspended from my residency in internal medicine. Six months later I was disqualified from the practice of medicine in my country for an indefinite time, along with my colleague Dr. Rodolfo Martinez Vigoa. It was enough to channel the opinions of 300 employees regarding our pay to the then Minister Dr. José Ramón Balaguer Cabrera, to be artfully separated from the National Health System. In exactly in the same place from which the Bishop addressed the audience in the lobby of this hospital, telling them to love and venerate the sanctity of the Virgin, five years earlier on April 24, 2006, instead of listening to a message of reconciliation, they launched scurrilous insults. That day, before a crowd of ashamed workers, my colleague and I felt on the backs of our necks the breath of the officers of State Security who were guarded our backs, as part of a spectacular display of the political police. In the middle a summary trial, the inquisitors lied to our faces to accuse us of something we never did. That shocking series of meetings, which lasted a whole month through dozens of health centers, was organized and led by the Head of the National Union of Health and the Provincial Party First Secretary, always accompanied by the Provincial Director of Health and a representative of the State Council. But to detail this story of abuse would take time. All the essentials of the case and the long series of negotiations that followed that atrocity and I let you know in a previous letter in October 2010, and they also can be found in “Citizen Zero”, the blog in which I manage to denounce this injustice. I am writing now to let you know that more than a year after that negotiation before You, everything continues as usual. Suffice it to say that after five years of abuse, my partner and I continue to be indefinitely ineligible to practice our profession, despite having continued, unsuccessfully, to target the central institutions of our country, repeatedly presenting documentary evidence proving that we are innocent of that of which we are accused, which separates us from our work, and as this happens the guilty remain unpunished. Your Eminence: Because you are an ethical man I write these lines, and do so in the midst of unprecedented circumstances in the political process that covers the last half-century of the Cuban nation. I am among those who believe in the sincere intention of the Church which you represent to intercede for the oppressed in this crucial time. For beyond what lies behind the intentions of the Cuban government, whether genuine human motivations or plain political pragmatism, the place of the Church is, because Christ wanted it so, to join with the dispossessed and the weak, for this is the only way to take an ethical stance and be consistent with its doctrine. Today it is one year since my friend Alfredo Felipe Valdes went into exile on January 17, 2011. His father, Alfredo Felipe Fuentes, prisoner of conscience from the Black Spring of 2003, had left 3 months earlier with a part of his family. As part of the agreement between the Spanish and Cuban governments, each professional in the exiled families was to leave with their respective university degrees in hand, duly approved by the Ministry of Foreign Affairs of Cuba. But because this has talen a long time to arrange, my friend Alfredo Felipe, the son, has already been in Spain a year without the ability to work because the agreement has been brazenly breached on the Cuban side, which has refused to send proof of his medical degree. Contrary to the advice of an inner circle of people, they left leaving the university degree in the hands of State Security officials, who demanded these gestures. This good faith gesture on the part of my friend and his mother, Loyda Valdes Conzales, Lady in White, was soon regretted. On multiple occasions they have asked for the documentation from the authorities at the Cuban consulate in Spain, without resolving the situation. However, this is not the case with the mothers of Alfredo’s children (from two previous marriages) who have had their documents in their possession for months. From the above it follows that the delay is deliberate in the case of Alfredo’s documentation. The degrees of his ex-wives are in order, and they have been working for months, while the exact same documentation for my friend is held back — he having assumed an open position of opposition to the regime when he was in Cuba — I have I have not the slightest doubt that we are looking at retaliation. Now, mediating between him and the Department of State Security, across thousands of miles of ocean, they not only seek to retain these documents simply to personally harass him, but exercising this form of revenge is all about pure political vendetta. This does nothing but reaffirm their petty nature. Anyone who promises something and does not comply, is not ethical, nor revolutionary, nor a man. If they don’t even respect their own promises, how do they expect the Cuban people to still believe in them. May these lines serve to denounce the miserable position of those who show no respect for their commitments and behave so inconsistently with their own word. PS: The eloquent gesture of my friend Alfredo was addressed to an officer of State Security who was on my right at the time of taking this photo during our farewells. Collapse in Havana. Chronicle of a Death Foretold. I do not know if it’s hyperbole when I say that Havana is on the verge of collapse. Definitely we are facing the most serious problem in this country, because although food and transport, for example, are serious problems and no one disputes it, if we unlocked the dominoes, they could be solved in the short or medium term. However this is far from the case with housing, which will require an entire multimillion-dollar strategic deployment and long-term investment if we want to rebuild this country. The issue of housing has become the chief bane of millions of Cubans. The tragic collapse in Havana of an occupied building on the evening of Tuesday, January 17, on Infanta, between Salud and Zanja, leaving four dead and five severely injured to a degree not specified in the official report, brings the issue once again to the fore. 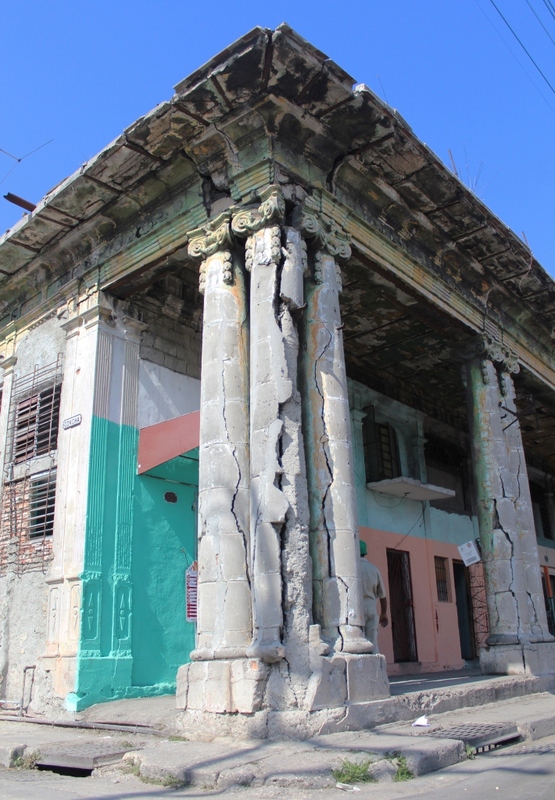 As a result of ill-structured policy for decades between the government, the Ministry of Construction, the Institute for Housing, and the Industry of Construction Materials, a considerable part of the buildings in Havana have evolved into a disastrous state. While the rest of the country is in a very similar situation, it is more evident in the capital given the high population density. It only takes a walk through the city to realize the existence of thousands of buildings over a century old — crumbling and inhabited! — which have not have the luxury of receiving a coat of paint, nor the slightest maintenance work for more than 50 years. Of course, these collapses do not usually occur in the quiet residential neighborhoods which eventually accommodate the “higher ups” — senior leaders, the gold-braid generals, the ministers and deputy ministers, successful managers, artists of show business stardom and all of a very select list of et ceteras. These disasters always happen in the neighborhoods of the forgotten, those who live too occupied counting every penny to consider undertaking repairs that are outrageously expensive. Walking through the slums of Havana and other Cuban cities can be to pass through all the possible ranges of degrees of poverty, as raw and brutal as you would find in any favela in Brazil or in the hills of Caracas’s poorest. But entering descriptions that illustrate such a drama poses a challenge for which I recognize I am incapable. Beyond preventive measures that could have been taken, it’s only a miracle that similar disasters have not occurred more frequently. While this situation went on and inch by inch the the foundation and support beams at Infanta and Salud gave way, abusive pricing policies that the Cuban government subjects its people to, allowed the Ministry of Finance and Prices to set, last year, $ 120.00 Cuban pesos as the price for a bag of cement, $ 250.00 Cuban pesos for one cubic meter of sand, and a single brick at $ 7.00 Cuban pesos; products they claim are sold “freely” when the average monthly wage here is around $ 400.00 Cuban pesos = $ 16.00 Cuban convertible pesos = $ 14.00 U.S. dollars. Now everyone laments, but instead of worrying fruitlessly, they should concern themselves with concrete cases as serious as those that illustrate this post. 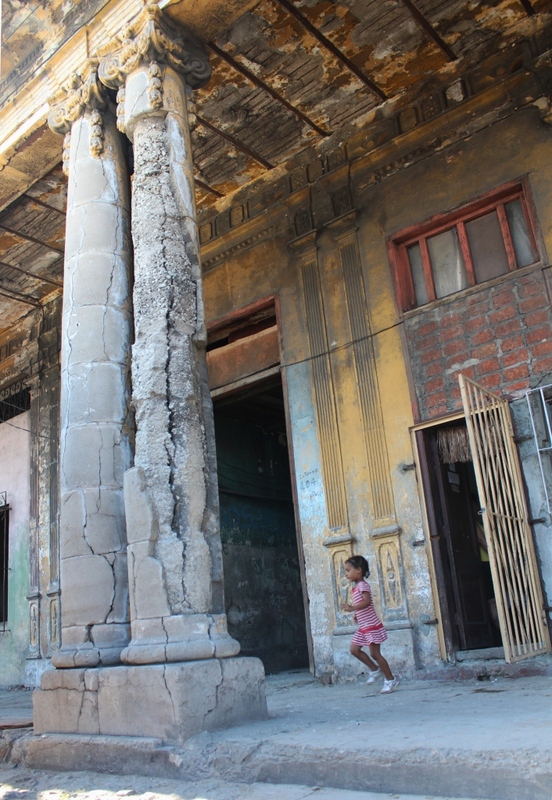 A site at Ave. Cristina (formerly known as Ave. de Mexico, which marks the boundary between the Havana municipalities of Cerro and Habana Viega) between San Francisco y Callejón de Concha, a building covering an entire city block is in a most dangerous state of disrepair since its old structure was shaken to the ground by the explosion of the Coubre in 1962. Dozens of families still live in it. There are similar cases all over Havana. It would be better if the that words titled this post, mere warning signs, never become black heralds sent by death. 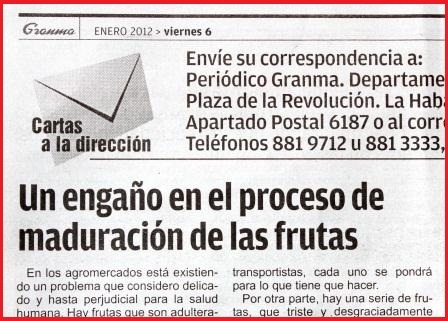 A "Letters to the Editor" section in the newspaper Granma, showing a letter titled "A deception in the process of ripening fruits." It never ceases to amaze me. 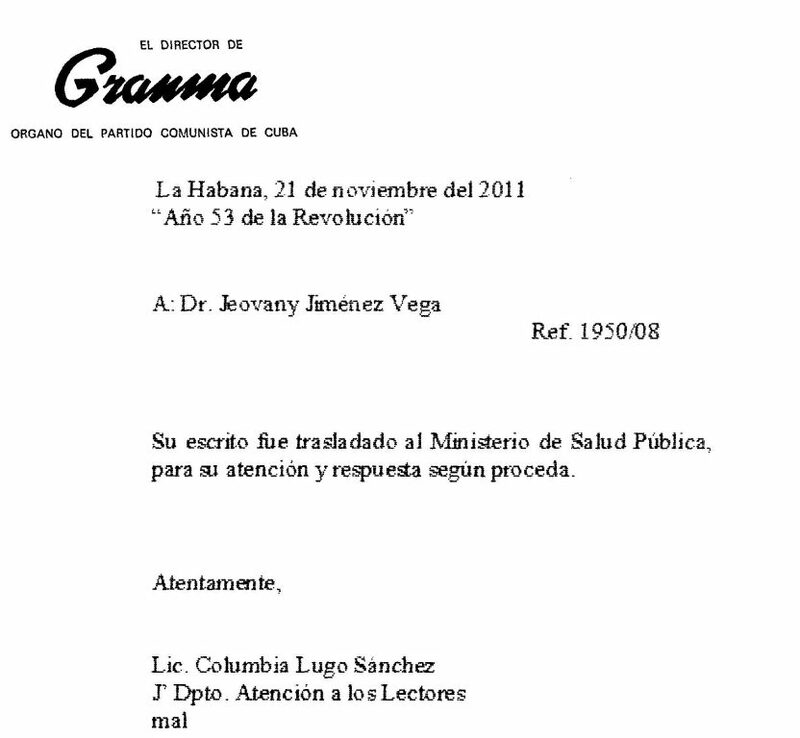 It turns out that Granma dismisses the seriousness of the case of two Cuban doctors disbarred, for over five years now and for an indefinite time in the future, from the practice of medicine in their country, for giving the minister a document that talks about wages that was signed by 300 healthcare professionals, meanwhile, it prefers to publish a review of green and ripe bananas. The same section “Letters to the Authority” that decided not to publish our case for several months and that led to “… for your attention and response …” to the same Ministry that punishes us gratuitously, does not follow the same protocol with the banality of cases like that cited, which should be sent, at the most, to municipal or provincial offices. I’m moved to laughter by the fact that that section prioritizes this case over others such as our own, and those even more serious. In their ethical myopia decide to “see” miniscule deception with regards to the ripeness of bananas, but choose to “not see” the impudent and outrageous fraud perpetrated on the MINSAP. It is cases like this that have made the Cuban press lose credibility with the people. Definitely they do not respect it. It leaves an empty space … my friend Alfredo goes into exile. In March 2003, that Black Spring, chaos erupted in his life. 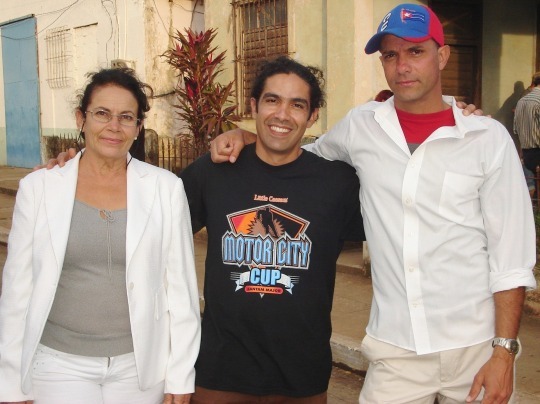 The son of Alfredo Felipe Fuentes, an opponent of the regime, and Loyda Valdes Gonzalez, Lady in White. His father, proselyte, irreducibly dissenting, fell into the round of 75 opponents taken prisoner. His crime, as far as I could understand, was to have in his home an independent library and the have participated actively in the collection of signatures for the Varela Project. State Security’s search of his home lasted over 7 hours. The lawyer who was in charge of the defense only had one hour, the time it took by car to drive from his home to the Court, to study for the first time a fat file inches thick. Already in the Court, the room deliberately filled with people who had nothing to do with the case, selected for the single reason to prevent the several family members from being able to witness the trial. The result of the summary trial: the prosecution asking for a sentence of 15 years imprisonment and the judge ultimately imposeing a sentence of 27 years, the third highest among the 75. Then Loyda, his wife, joined the activism of the Ladies in White, who stopped at nothing and the rest is history. Alfredo was released last October 7 and exiled to Spain. last October 7 was released and exiled to Spain along with part of his family. A health situation delayed the departure of the rest. Today they fly to the desired reunion. Leaving with his family is Alfredo the son, my friend from when we were young until now. An unconditional friendship, even when it came my turn to face the storm, he was at my side and assumed all the risks along with me. In 2002 he signed the Project Varela petition and later other civic initiatives, including a public letter to Raul Castro. With his high regard for human dignity and indignation before any offense converted him, also, into a signatory of our Letter of the 300 workers, to the Minister of Health in November 2005. A doctor with soul, poet, engraver of chimeras, hopeless dreamer, transparent and luminous spirit, an adamantine being. He leaves here others to whom they scream slogans, others who in the name of that Revolution try to legitimize barbarism; that authentic Revolution in which, despite everything, we continue to believe, that Revolution betrayed by so much simulation, raising of straw men, and opportunism that has offended and defiled this beloved land. I’ll see you my brother. The future must be better! 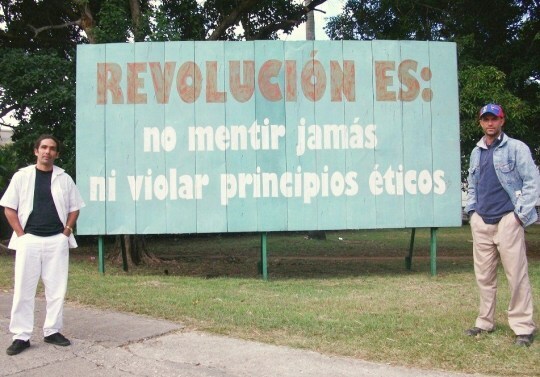 Revolution is: Never lying, never violating ethical principles. Translator’s Note: This early post from Jeovany’s blog is translated and presented here as a reference point to the following post, Medicine in Cuba Today: A Series of Shortcuts and Scarcities, which was written by Jeovany’s friend Alfredo whom he speaks of here. The year 2012 has arrived, and presents Cubans with more dilemmas about the future than the intricacies of the Mayan predictions. Our people greet the new year in a kind of stupor from which they want to wake up, but can’t, living a dizzying unreality in which there are no clear boundaries between the certain and the uncertain. I believe I am right in saying that Cuba today has entered the most complex stage of its history, and I will explain roughly what I mean. During the first half of the 19th century, the natives arrived at a discovery, different from the Spanish version, of that which finally defined our concept of nation, handed down from thinkers like Varela, and de la Luz, and Caballero. Once this point was reached – where the colony-metropolis contradictions would only get worse – it logically raised the issue of final independence from Spain. The thirty-year period of deeds of liberty that covered the suffering of the Cuban people with glory, left history a thrilling example of greatness. North American intervention and the meanness of the Treaty of Paris – signed on the back of Cuba, ceding the ripe fruit to the United States – sealed our fate for the next 60 years. It was followed by decades of advances and setbacks, political struggles that eventually led to the accumulation of antagonisms that made us once again propose armed struggle, this time to shake off the Yankee neocolonial yoke. The revolution led by Fidel Castro in 1959 ended the relationship of subjugation that Cuba had maintained with its “good neighbor”. At this point is where we must elucidate an essential element that differentiates what is coming from the past: if until that moment it was always about trying to expel a foreign power, starting from then — after the fervor of the early years of genuine popular support — it resulted in a State-individual relationship ever more despotic, exercised this time by Cubans over Cubans. The bearded ones had dismantled their camp in the Sierra Maestra and transplanted to Havana the same mechanism of operation. 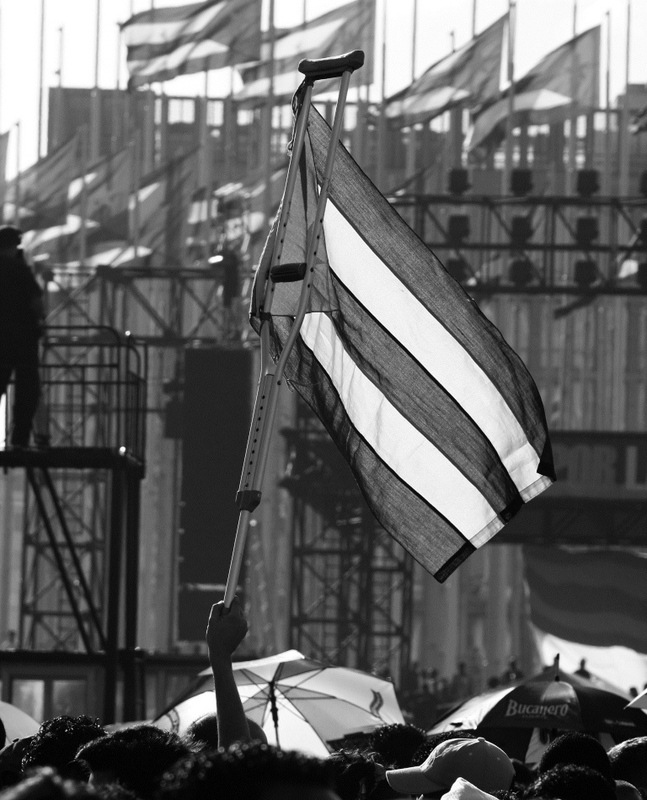 Thus, in the name of freedom and with the guise of social justice as a backdrop, step by step they curtailed the civil rights of the people, a political strategy intended to legitimize themselves from an extreme nationalistic discourse that presents the official alternative as the only one valid to guarantee the independence of the country. In time, the resources of the State are directed more and more towards an iron strategy of control, hammering over decades a harangue that constantly encourages the paranoia of a people besieged. Between the Yankee embargo and the tropical cyclones, the arguments of Fidel Castro are put forward to justify the ruin provoked by 50 years of bad governance and the necessity of stagnation that paralyzed this country in the decade of the ’60s. Then, faced with the growing discontent of the population, the only recourse left to the elite is growing repression and censorship. Although admittedly an objective approach to this reality can not ignore another side of it. Their conviction that the centers of U.S. power, organized from Langley, were focusing on terrorist attacks, economic sabotage and assassination plans, caused the Cuban government to consolidate its political position, and they decided to reorient their strategy towards the internal opposition. 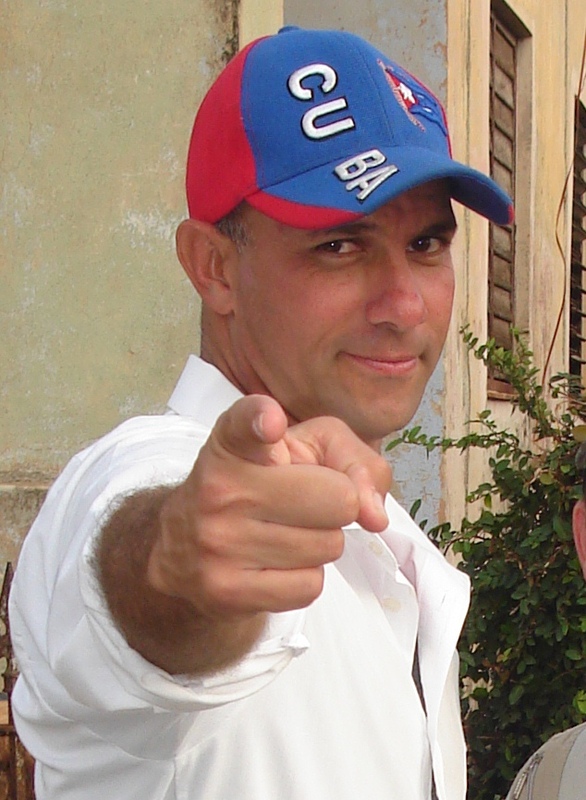 Then, the whole Cuban apparatus of espionage and counterintelligence, structured and refined during 50 years of dealing with their formidable American counterparts — the largest and with the most resources in the world — having no mountain ranges to clear of rebels, nor commandos infiltrating along the coast to detain, has come to focus with more intensity than ever on the domestic scene, and in this context we come to 2012. Now, under the guise of genuine defense, every civic initiative of any individual or group of individuals, even without the remotest connection to the United States and however spontaneous and legal it is, can be accused – and in fact almost always is – of serving the U.S. In this way civil society in Cuba is kept disjointed, and in practice non-existent, not to mention the avowed political opposition, which is not officially recognized and which remains infiltrated to the core by State Security, maintaining the dissidence exactly where they want them, consistent with the needs of the powers-that-be, that is divided into a thousand dispersed pieces. But despite everything the Cuban government has engineered, they manage, through subtle emotional blackmail, to convince many governments to applaud it in the international arena, to the point of naming Cuba Vice President of the United Nations Council on Human Rights, at the same time it is depriving its people en masse, before the eyes of the whole world, of their civil rights. It is in this inconsistency between what our government says and what it does, and between what it does and what international organizations should do, where much of the complexity originates — unprecedented in our history — to which I referred earlier: we have become a people caught between demagoguery on both sides. Thus, the new year was received by a society that has no mechanism to channel the real aspirations of the people below, whose unions are a grotesque caricature that only flirts with power; which has no autonomous press to denounce the corrupt bigwigs, or that dares to openly question the policies outlined by a single ruling party, which draws all the coordinates of the politics and economics as I understand it, and without opposition of any kind in a sterile Parliament. In this scenario, citizens remain helpless facing an absolute power able to relegate all to assert its doctrine of submission, for it does not skimp on all the resources it deems necessary, even in the midst of a perpetual economic crisis. Today, however, I cannot hide my pride in all the glory that preceded me. So I believe in the Revolution that was consecrated in La Demajagua — the site of the beginning of the Ten Year War in 1868 — that offered the blood of Jimaguayú, that shuddered in Dos Ríos and in the plains of San Pedro; that of the Generalisimo who saw the bodies of his dead sons sink into the ground of the fatherland, the redeeming sword shaking in his fist. I believe in the civic Revolution of the veterans of the Republic castrated by the Platt Amendment, the people who took to the streets in the ’30s and overthrew a tyrant; I believe in the Revolution of Julio Antonio shot in the back, of the courage of Guiteras and in the salvo of Chivas. I believe in the Revolution which resumed its quest in the morning of Santa Ana, I believe in the truth that burns behind the fearless eyes of Tassende and in the eyes of Abel, inert, and yet so alive and so pure like the tears of Hayde; I believe in the transparent gaze of Frank, in the recklessness of Echavarria, in the clean smile of Camilo that evaporated in glory and of Guevara abandoned by Manila, but true to himself until death. Once there was an authentic Revolution that was necessary and another “revolution” that betrayed, the “revolution” of pamphlets that, in the name of “freedom,” cut short the true freedom of man; that of the the “revolutionaries” without certain convictions, alienated in their lie, in their fantasy or in their attempt at power, but finally disposed of, back to life that ran its course; rhetorical “revolutionaries” of hardbound verbiage, which ceased to be an engine, flying and dreaming, to turn itself into, over the years, an obstacle, a knife, or an empty pedestal. This “revolution” of glass, which may adorn itself with tinsel and garnish its podiums, with round tables and speeches, covering a set for staging where “revolutionary” neo-bourgeoise simulate their script, but which purports to be more convincing than ever, never ceases to be a fake and will never be genuine because on can always distinguish, under the artifice, the fool’s sheen of sequins. Behind the facade, among the lamps tested again and again, while the genuine revolutionaries are dying of shame. As this happens, the most honest and enlightened of my people remain marginalized, because in this climate of calculations and simulations they can only enthrone the opportunists and those willing to communicate with the lies that power needs to hear, a power that does not allow questions and pays well for the irreverence, requiring absolute submission in exchange for rewards, privileges for that caste of hypocrites, who applaud him on stage and later plunder the people’s pantry. As long as this dynamic bends and genuflects, the power will be willing to look the other way: it will endure those who steal from it, endure those who defraud it — with due “prudence” of course — but it will never consent to differences of opinion. A sentence is never free, not when you live in Cuba. Here, the plan of absolute centralization is not only limited to economic relations but also, perhaps even to a greater extent, all reading material is given a pro-government hue. Undivided power in the essential condition for this to happen. Absolutism has made sure that all channels of social interaction move towards the central hub of decision making. Then, with military precision, the orders of the political-military duo, coming from the Communist Party-State Security pairing, will be executed. If one establishes a rigid manifesto, the other contributes the copious amounts of intelligence which, once analized in the only centre of power, means that the tactical or strategic decision most convenient for the establishment is taken without any concern that this might directly contravene the written ‘law’. Nuestro caso (our case) is an excellent example of what I’m saying. There are two moments in our history in which this modus operandi can be seen to be typically ignorant of the truth. The first in March 2008, after the attempted hunger strike mentioned here, we decided to restart negotiations with the State Department by conventional means. 10 days later the only response that we had received from the government in 5 years arrived. ‘…we have decided to inform the Ministry of Public Health, for your consideration and reply.’ That is to say, they sent us to the slaughterhouse one again, becoming both judge and part of the entity on which it called. A second incident came three years later, last 15th August, when I wrote to the Granma newspaper – some days later I also wrote to The Workers and Rebel Youth – only getting a couple of lines from Granma in reply. ‘Your letter has been sent to the Ministry of Public Health for your consideration and reply according to convention.’ Obviously, the uniformity of style warns that it is the same hand writing in both cases. Last 3rd December, Latinamerican Medicine Day, Granma congratulated me with this succinct reply, this time sent by conventional post, for directing myself towards the ‘Letters to the Editor’ section once again, more than 3 months earlier. I’d already had a reply on the 10th October by email – that time must have been for my birthday – had begun, on 17th October, with an affectionate letter to its splendid editor Lazaro Barredo Medina. The stamped envelope, when it arrived at my door, reminded me that, in spite of the world having spun hundreds of thousands of times, whenever and wherever the emperors come to power, all paths, roads, boulevards, lanes, avenues, tracks and trails – even short cuts – lead ultimately to Rome.